Earlier this month we paid our first visit to Broadway Theatre in Letchworth for a children’s classical music concert: Vivaldi’s Four Seasons. Not very child friendly you might presume, but this was a concert with a tremendous difference. The music, played beautifully by the Baroque Realm of Music, was accompanied by local author and illustrator James Mayhew (whom many will know from his Katie and Ella Bella books). 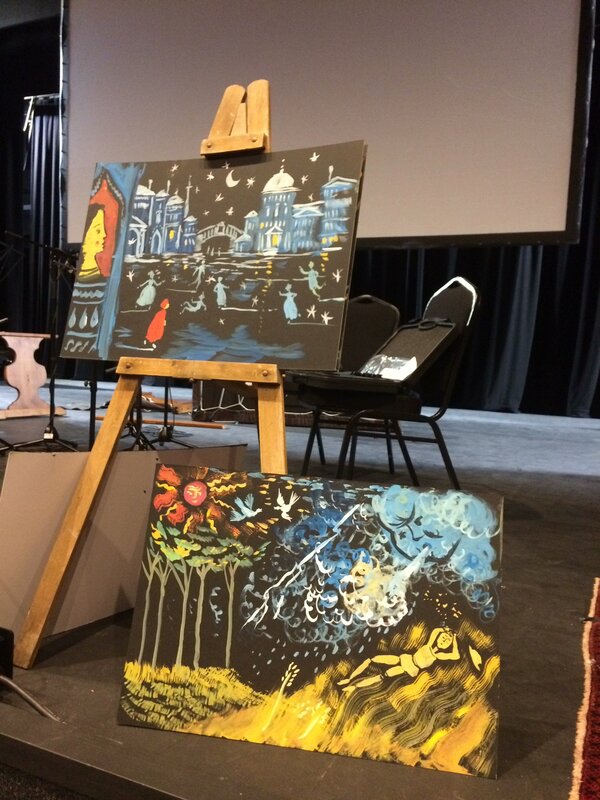 While the musicians played, James Mayhew (dressed as Vivaldi) painted the story of each season on a canvas which was projected onto a large screen for the audience to see. 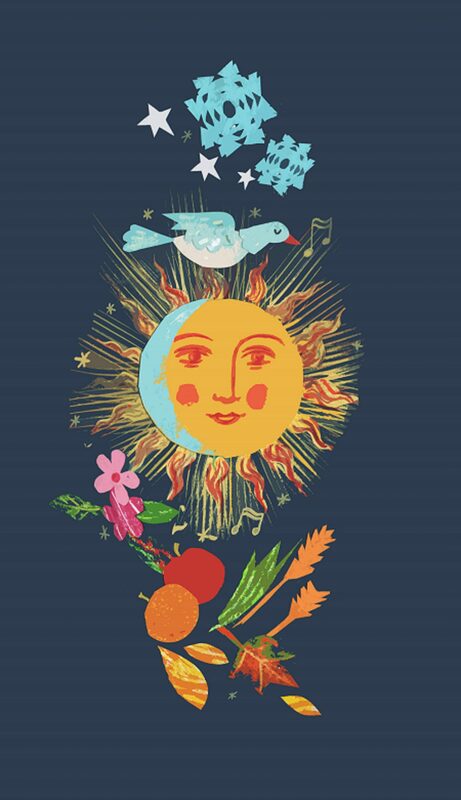 I’ve listened to Vivaldi’s Four Seasons plenty of times but seeing it come to life on a canvas offered so much more understanding of what the composer was expressing. The musicians, playing violins, cello, double bass and harpsichord, were ably assisted by two children using some very convincing (and unusual) percussion instruments to create the sound of rain and thunder while James Mayhew painted the needles of rain pouring down on a summer’s day. Elsewhere, in winter, we saw ice skaters in snowy Venice, while spring saw a bright sun warming a meadow and autumn included a hunting scene amid harvest time. I hadn’t realised that there are actually words accompanying each piece of music in the Four Seasons, allegedly written by Vivaldi himself. Each one, a sonnet, describes what is happening during each of the composer’s four seasons. James Mayhew read these before each piece of music was played, further enhancing our understanding of what Vivaldi was communicating. Who would have thought that a three year old could sit through an hour-long classical music concert? Well, that’s exactly what our (usually very busy) toddler did along with his five year old brother. They did wriggle around quite a bit and ask questions in quite loud voices, but it was a very relaxed atmosphere so this wasn’t a problem. With classical music often seeming too aloof and serious for young audiences, this collaboration of art and music was such a refreshing and welcome experience. We had previously watched James Mayhew in action at nearby Hertford Theatre where an orchestra brought to life his Knight that Took all Day story. Our children had been so entranced by the experience (as had we) that we immediately booked the Letchworth concert and I’ve no doubt we’ll be seeing him again when he’s next in the area. His website has details of his future projects. At the end of the Four Seasons concert, the paintings were auctioned for charity while in Hertford there was a charity raffle resulting in families taking home original artworks, what a fabulous idea! Letchworth’s Broadway Theatre is a combination of cinema, gallery and theatre, housed in an Art Deco building in the centre of this much underrated town (in the summer we’re big fans of the wonderful Howard Gardens paddling pool). The theatre part of Broadway is a new element, adding to what was originally just a cinema. Apart from the obvious art-related benefits, it also means popcorn for sale at the theatre, a definite crowd-pleaser with the children who attended the concert. There’s plenty more going on for families in the coming months including David Walliam’s First Hippo on the Moon and Julia Donaldson’s Scarecrows’ Wedding. Thanks to the Letchworth Heritage Foundation for supplying the images. Have a read of our visit to the Henry Moore Studios and Gardens in Hertfordshire for more family-friendly art inspiration. This post had me very excited! Like you, I’ve always thought it would be difficult to get children enthusiastic about concerts – especially when they’re very tiny. This sounds like the perfect way to grab their attention. 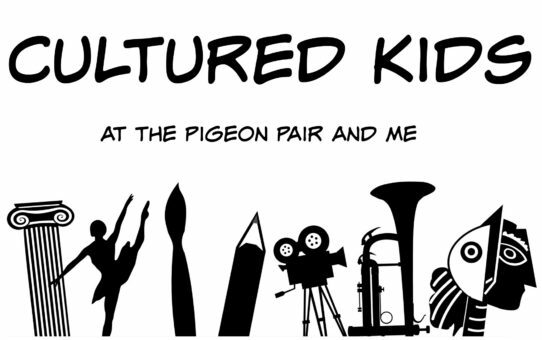 Thanks ever so much for linking with #CulturedKids! You must go to one! They’re totally brilliant! What an interesting way to keep kids interested while they listen – although never mind them, it would keep me interested too! Yes, I don’t think painting and classical music should be limited to children’s concerts, there’s definitely a gap in the market to be filled there! I really wish school holidays lasted longer so that we could get into London more often for visits to places like the Southbank. Just not enough days in the year! Certainly not enough holiday days!